Back in January Katie from The Stories That Really Mattered asked us to declare “I’m a Marvel” or “I’m a DC”. For those who aren’t comic-book-literate Marvel and DC are the two biggest names in comic books. For some this would be an easy choice as they form a bond or affiliation with a particular publisher and the universe they have created a little like the way sports fans chose a team and immediately dislike their local rivals, but for me it’s proving to be a bit of a problem choosing. The problem starts with the big hitters, I am not really a fan of Spider-Man (Marvel) or Superman (DC), I don’t dislike them, I just can’t get excited by them. Then we move onto what I do like, I didn’t read comic books as a kid but did read some X-Men as a student and enjoyed them, when the movies finally came out, directed by Bryan Singer the first two were great movies, it did go downhill for the third and the Wolverine spin-off. Hopefully X-Men: First Class directed by Matthew Vaughn will get the franchise back on track. Then we have Blade, forget the rubbish third instalment and take a look at the first two movies in the series. The first movie, released in 1998 is probably the most important Marvel movie ever made, a co production between New Line and the newly formed Marvel Studios, if it had failed the world of comic book movies would probably look very different now. So what do DC have to offer? Batman! Back in the late 80’s and early 90’s Tim Burton made two great Batman movies before Joel Schumacher took over and fucked it up. This could have been the end of “The Caped Crusader” on film but then out of nowhere British auteur Christopher Nolan gave us Batman Begins and The Dark Knight. A lot will rest on The Dark Knight Rises, it could turn out to be the only comic book movie trilogy without a week link. Lets look at this from another point of view, a hero is only as good as his adversary, Magneto is good, but he is no Joker! 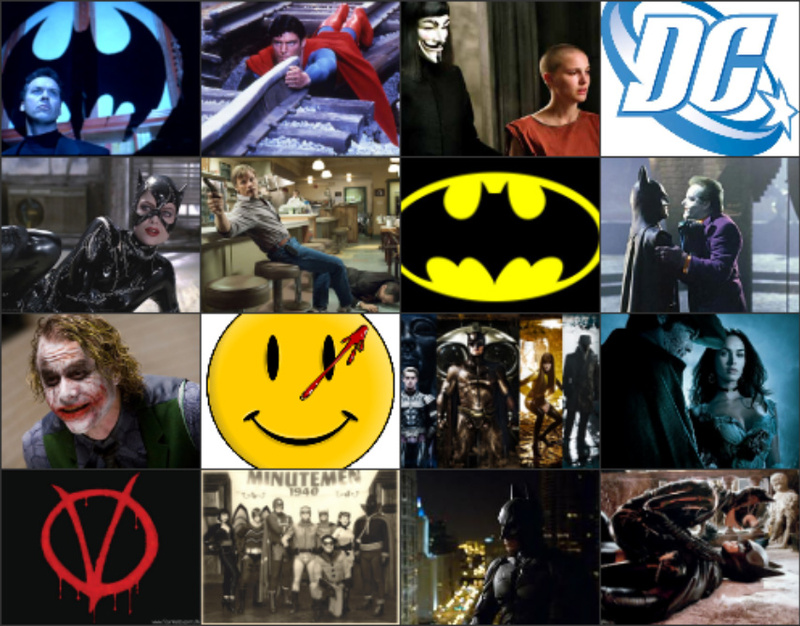 Then we move away from the big name franchises and look at some of the other comics DC have produced that have been made into great movies: Watchmen (much underrated), A History of Violence and V for Vendetta (in America). The tide could be turning in DC’s favour. So where does that leave me, am I Marvel or DC? Katie has created an online poll with the cop-out answer “I’m a Marvel…except for Batman”. So am I Marvel…except for Batman or can I nail my colours to one side or the other? I am not going to take Katie’s cop-out, or invent one of my own, “I’m DC except for the X-Men”. None of the above, I thought I was a Marvel I may just be a DC so I am going to sit on the fence a little longer. It’s still a cop-out I know, sorry Katie. I write a lot about movie ! Ahah, nice line Katie. I just saw the first X-Men and that was one of the better lines from Halle Berry. I still have to do this post and trust me, I will choose a side. on February 17, 2011 at 6:56 pm | Reply Aiden R.
Hahaha. Wish I had more folks backing me up as a DC, but it’s refreshing to see someone who’s giving props to both ends of the spectrum. They’ve both got their pros and cons and I don’t blame you for sitting on the fence. Good on ya’, man. Aiden: Actually if you look at the poll results DC is trashing Marvel. I need more people on my side to vote!! I don’t think you want me to choose a side, if I chose today it would be DC!